This sofa table is the perfect addition to your home for a modern storage piece. Two shelves make it easy to display your nicknacks and the top creates the ideal place for your guests to set their drinks. 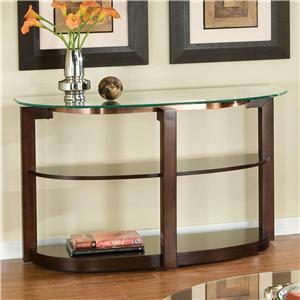 The glass shelves and top are accented by the Black Nickle finish for a handsome contemporary look. The 72022 Sofa Table with 2 Shelves by Coaster at Carolina Direct in the Greenville, Spartanburg, Anderson, Upstate, Simpsonville, Clemson, SC area. Product availability may vary. Contact us for the most current availability on this product. 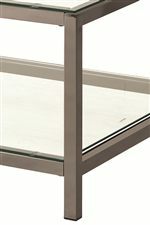 The 72022 collection is a great option if you are looking for Contemporary furniture in the Greenville, Spartanburg, Anderson, Upstate, Simpsonville, Clemson, SC area. Browse other items in the 72022 collection from Carolina Direct in the Greenville, Spartanburg, Anderson, Upstate, Simpsonville, Clemson, SC area.